Jonathan Wafula in action against FC United, Boston's last home fixture. Jonathan Wafula believes Boston United need to learn how to relax at home. 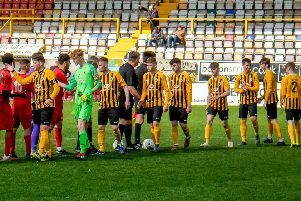 The Pilgrims face two crunch contests against two promotion chasing teams at the Jakemans Stadium in the space of three days. AFC Telford United will be the first to visit on Saturday, with Stockport County arriving on Tuesday. The arrival of Telford will be United’s first home contest in a month, since their 2-1 win over FC United. And while winger Wafula knows that home success was vital, he adds that the team must learn from it and improve their Jakemans Stadium form. “It was very important to win at home. You can tell we put a bit too much pressure on ourselves,” he said. “We need to relax. You can see that the sooner we do that in matches the game just eases off and chances come easily. “That’s one for me to take into home games - relax, don’t rush it. United have failed to find top gear at York Street this term, losing nine times, winning six and drawing two of the contests played in Lincolnshire. Wafula adds it is important for Boston to now maintain momentum. “It’s up to use to keep that up,” he said. “The fans want goals and the tempo going up, but we have to play our own game, stay in the game.